Valentine's Day Archives - Page 13 of 13 - Pebbles, Inc. 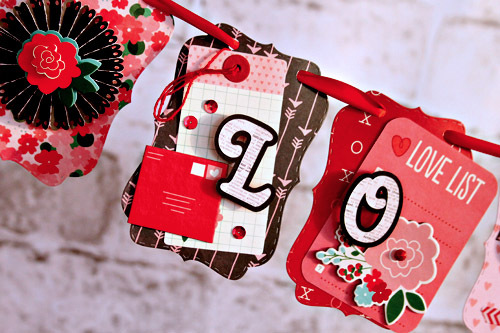 Looking for a fun photo prop for your Valentine’s Day shoot , or a pretty banner to hang on the mantel? You’ve got to check out the lovely banner Designer Candace Zentner created. 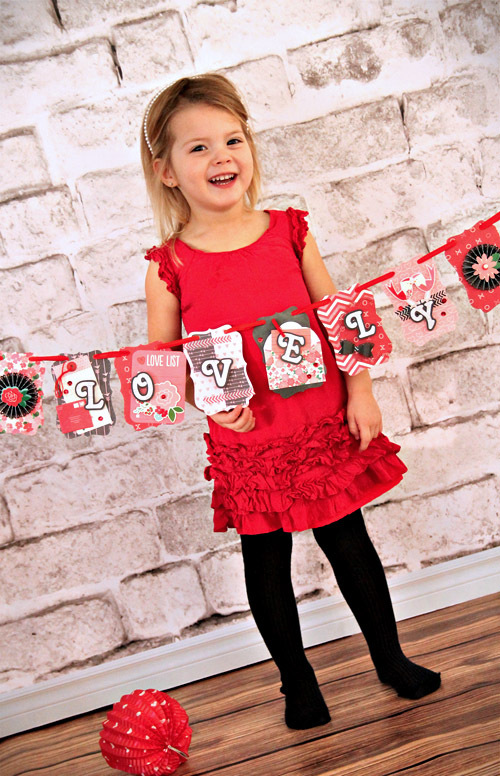 I love that banners are popular as props in portrait photography right now! Mostly because I love making banners and I love photography!! 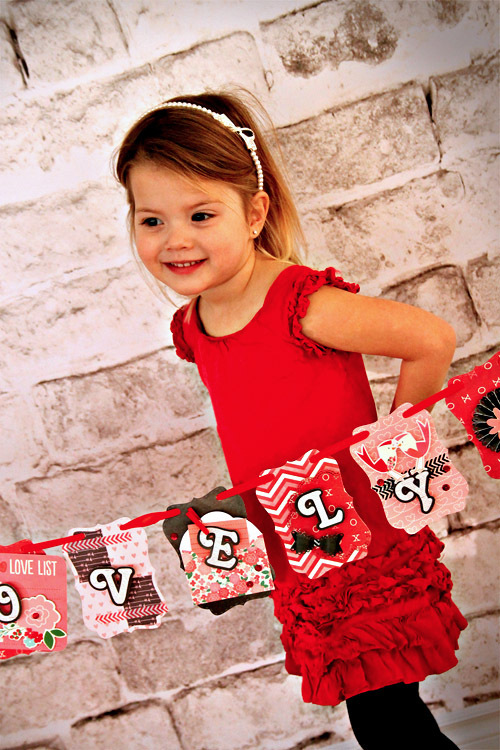 Since I frequently have photo shoots with my daughters, I thought the Yours Truly collection would work perfectly to create a fun banner to use as a prop. 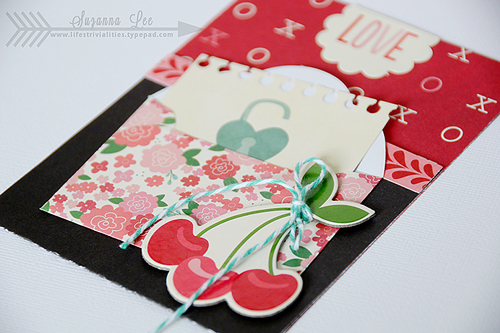 I used a simple die from Jaded Blossom to create each pennant in my banner and decorated each piece using stickers, tags, chipboard pieces as well as other fun elements in this collection. Although this banner may look like it was rather involved to make, it was actually very quick! Since there is such a great variation of embellishments in this collection I found it very easy to make each pennant unique and pretty. I also had to share some of the pictures from the photo shoot with my daughter, so you can all see the banner in action! 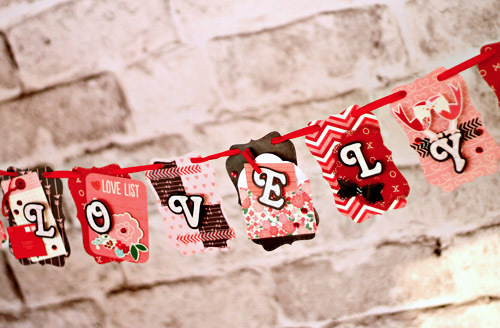 The banner will also make a great piece of Valentine’s Day décor! 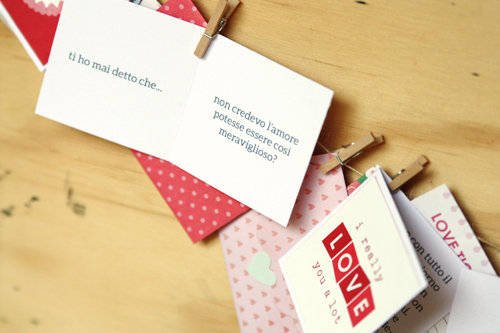 Looking to leave a little note for your loved one this Valentine’s Day? 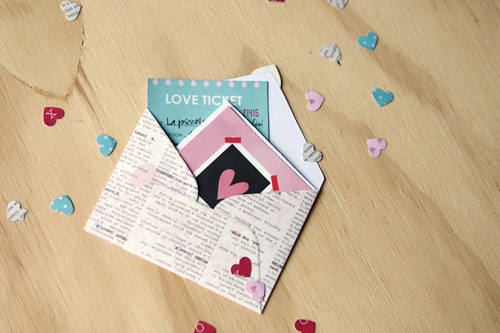 Check out the adorable mini love notes we’re featuring created by Designer Eva Pizarro. 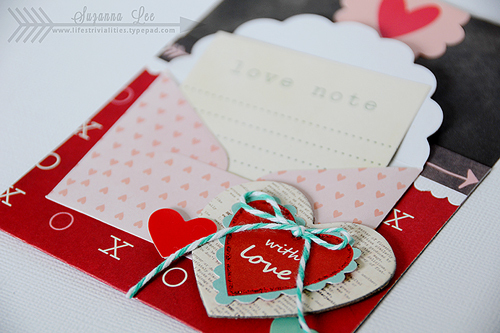 I love to prepare little games or leave love notes for my husband on Valentines day. 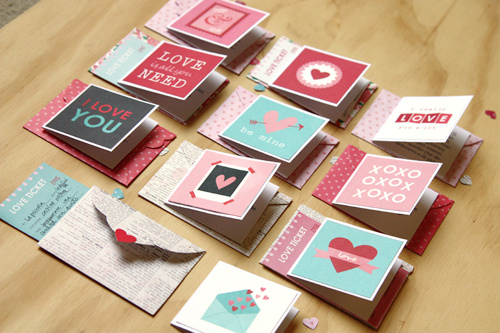 This year I prepared some mini cards with cardstock and one of the sheets of paper from the Yours Truly collection. I plan to hide the little notes in some places where he can find them during the day (his briefcase, his closet, with his lunch, etc…) I’m sure he is going to love the surprise! 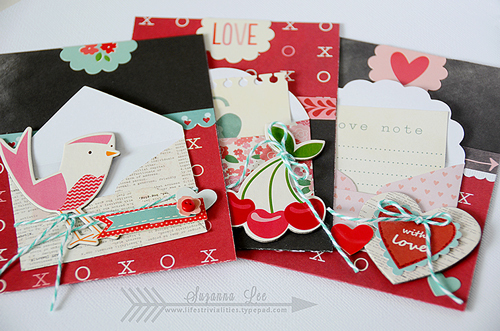 Set hearts a flutter with these Valentine’s Day pockets made using the Your’s Truly collection, by Suzanna Lee. The great thing about these sweet little pockets is that you can create 3 pockets from one 12×12 piece of patterned paper! Each pocket is 4 inches wide so cut three strips. Fold up 4.5 inches from the bottom and lop off the top inch. 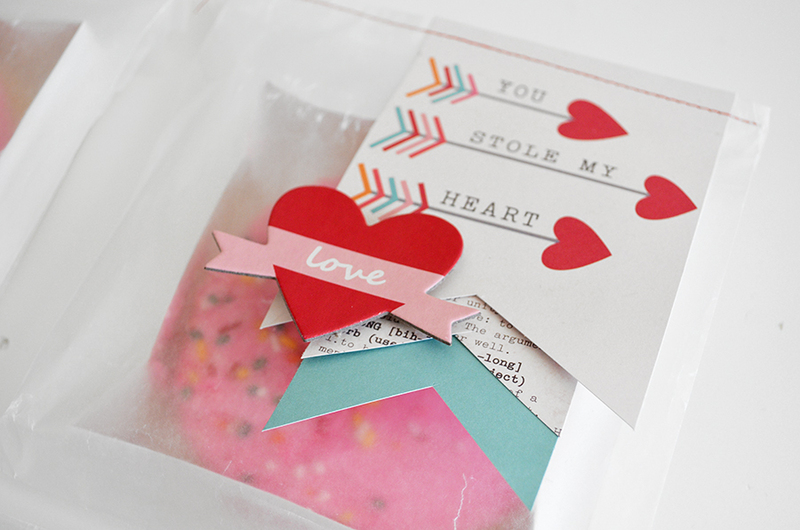 Use your adhesive runner down each outer edge to create the pocket with little fuss or waste. Take your pick of the many embellishments that accompany this collection and decorate away! Everything matches perfectly so it will all come together in a heartbeat! 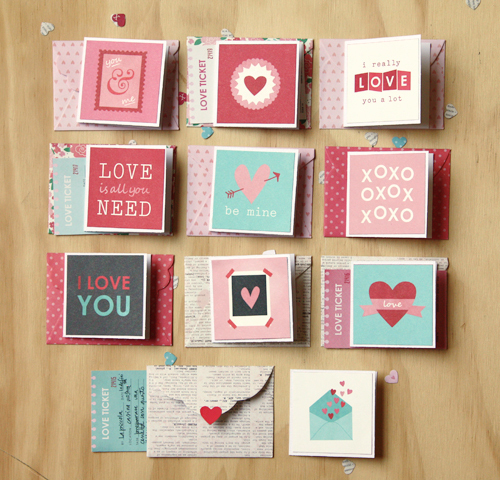 Each pocket Valentine has an envelope and note (cut journaling cards) on the front which bind the ties of the three together. 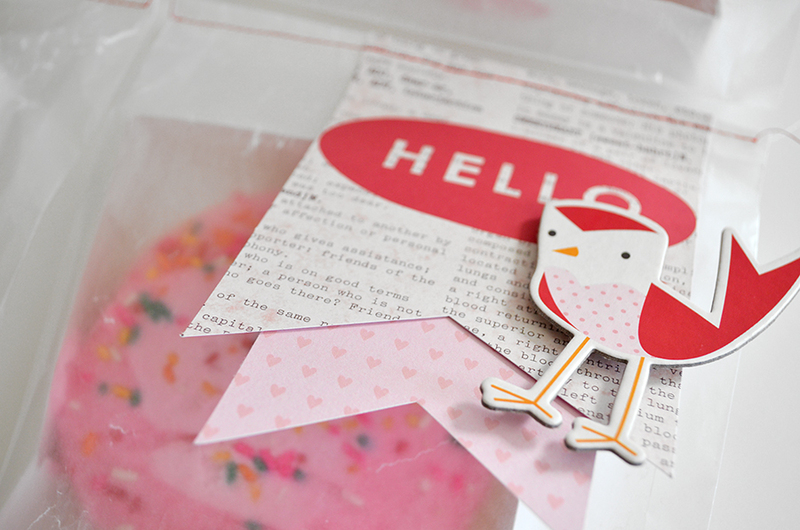 Layer chipboard pieces with stickers and it’s simple to piece together! You could even have a child help you with these for a whole class. My original intent had been, and still is, to find some of the sugar pixie straws to put in the pocket for a little taste of Valentine sweetness. Cute, don’t you think?! 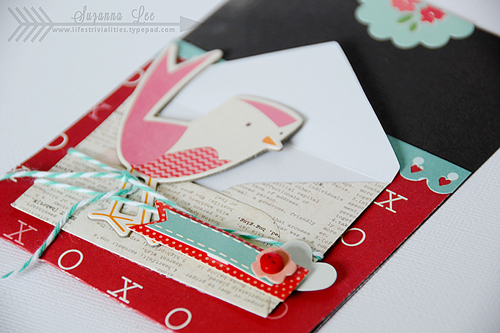 Designer Tip: I know we all have paper a plenty but why waste? Make it simple, forget the fancy flaps on the side just run your adhesive up the sides to create the pocket. The pocket “edges” are the paper selvages! With Valentine’s Day just one month out, you know we’re getting excited. 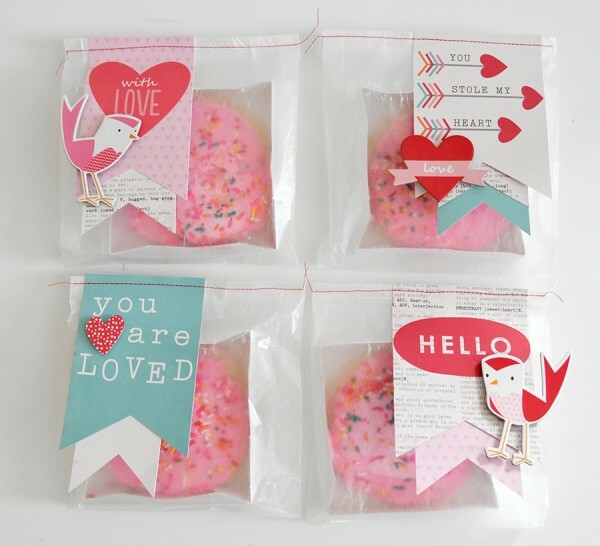 Today, Designer Wendy Sue Anderson is sharing a fun way to dress up a store bought Valentine’s Day treat. 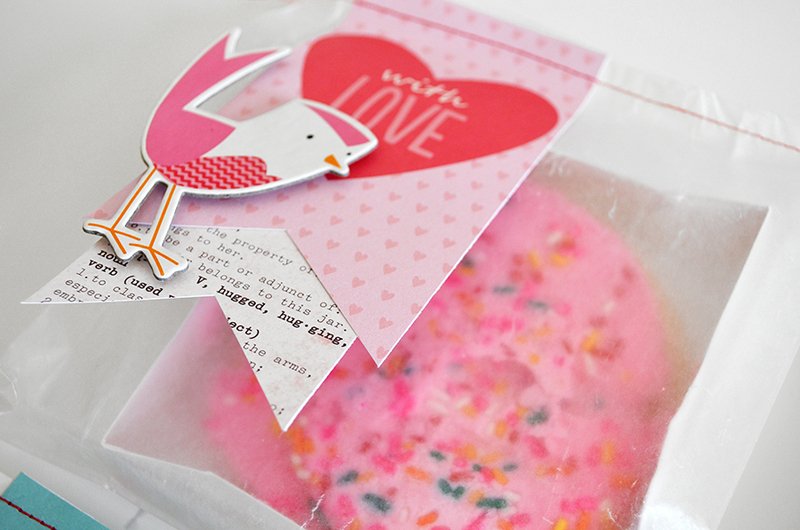 It’s so cute, we think you’re going to love it! 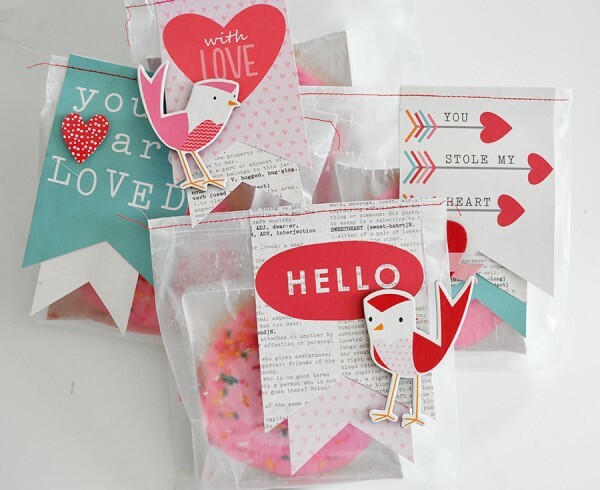 I love any excuse to give a little gift or treat to friends and family – and with Valentine’s Day just around the corner I’ve already started to get the creative gears turning with a little “love” in mind. 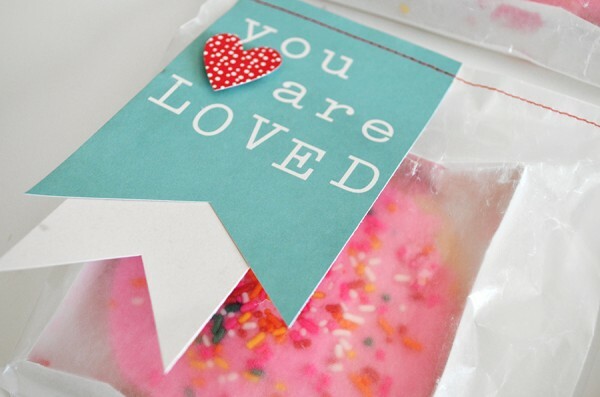 If you’re looking for a super easy (and super cute) little gift, try repackaging a store-bought treat. 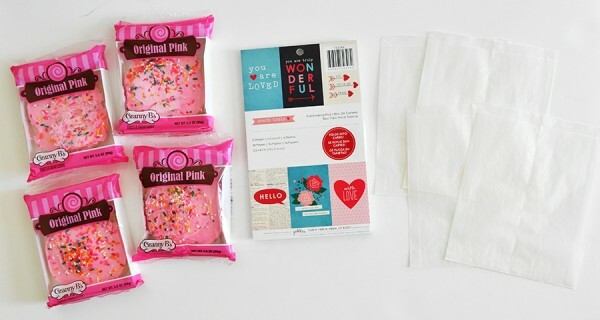 Here’s all you need to make these cookie packages – yummy pink frosted cookies, the cardmaking pad from the “yours truly” collection, the chips from the “yours truly” collection (not pictured), and a few glassine bags. 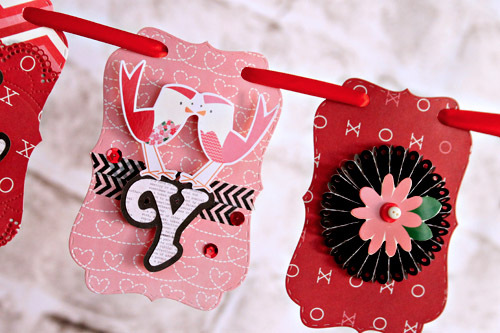 Simply cut the card fronts from the cards in the pad and then trim them into banner shapes by cutting the bottoms into an inverted “v” shape. 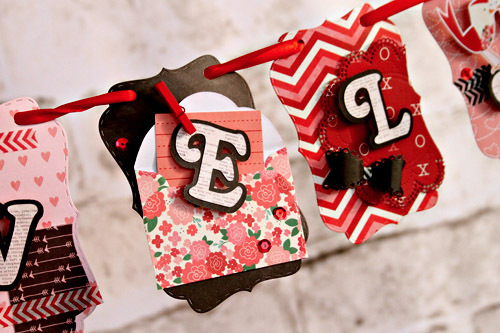 Use the leftover pieces from the other cards to create extra banners for layering. Add a chipboard shape to each banner – consider using foam dots to add a bit of dimension. Now unwrap the cookies and put them in the bags. Fold over the tops. Place the cute banner on the top and run them through your sewing machine – use colorful coordinating thread for a fun look too!